Catacomb Tour runs Monday – Saturday 10:00-11:30am and 1:30-4:30pm, Sundays and holidays 1:30pm-4:30pm. The Cathedral Treasury is open Monday – Saturday 9:00-5:00pm, Sundays and holidays 1:00-5:00pm. The towers are open daily from 09:00-5:30pm. This tour runs year round. We are comparing St. Stephen's Cathedral Vienna, Tower & Catacombs Tour Prices from leading ticket suppliers and Try to find you Cheap tickets prices on the market. St. Stephens Cathedral was built in the 14th century on the ruins of two former churches in the heart of old town Vienna. This picturesque place of worship has a colourful roof, free-swinging church bells and two towers to climb inside. The cathedral boasts both Romanesque and Gothic architecture and is considered a cultural heritage site and a beloved monument of Vienna. The cathedral is so popular attracts close to 5.4 million visitors a year! For more than 700 years it's been considered one of the most important landmarks in the country and the most beautiful building in the city. Inside you'll find a wealth of art treasures included a red-marble sepulcher, the largest bell in Austria and a Gothic winged altar dating back to 1447. Not only is the cathedral a place of worship and of grand historical significance, it was also the venue for Mozart's wedding to Constanze Mozart in 1782. Great for those on a tight budget at this all inclusive ticket saves over 35%. Art historians, culture vultures and architecture buffs alike will delight on this tour. Your Experience With St. Stephen's Cathedral Vienna, Tower & Catacombs Tour? Take an audio tour around the beautiful St. Stephen's Cathedral. Climb up the cathedrals North and South towers and enjoy spectacular views over Vienna city. Take the lift up to the church bells (the largest in the world) before descending down into the catacombs. Learn about the churches rich history and how religion is a large part of culture in Vienna. Admire the buildings gothic and renaissance architect. 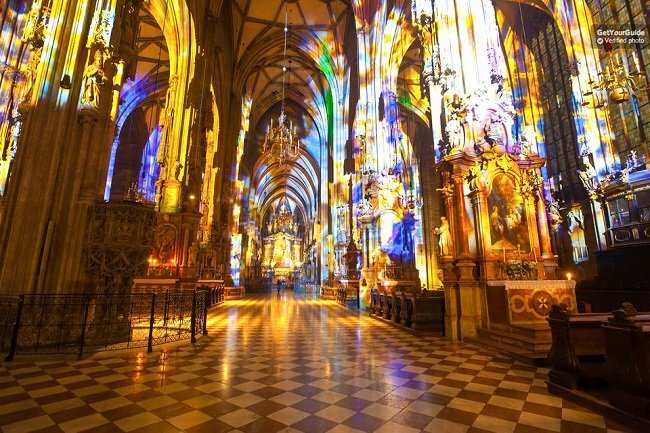 What St. Stephen's Cathedral Vienna, Tower & Catacombs Tour Includes? Entrance to St. Stephen's Cathedral. A 40 minute audio guide of the North Tower, South Tower and treasury (audio available in French, German, English, Italian, Spanish, Chinese, Dutch and Japanese). To collect your tour ticket head straight to St.Stephen's Cathedral. Inside, on the left, you'll see a ticket counter. Simply present your voucher at the desk. Travelers Reviews about St. Stephen's Cathedral Vienna, Tower & Catacombs Tour? This tour is rated 4.5 stars on Tripadvisor with many customers calling it a “must do tour” and an “unmissable experience”. It was also said the staff were comprehensive and knowledgeable and that the cathedral was outstandingly beautiful. Parts of this tour are accessible for wheelchair users but please advise your tour provider in advance. Tours booked through Get Your Guide or Tiquets can be cancelled 24 hours in advance for a full refund. You must have a reasonable level of fitness to climb the South Tower as there's no lift, just 343 steep steps to climb! There are different opening times for different parts of the cathedral, make sure you're aware of them before you arrive for the tour. St. Stephen's Cathedral, Stephansplatz 3, 1010 Wien, Austria.